Company bylaws are the rules that govern how a company is run and one of the first items to be established by the board of directorsBoard of DirectorsA board of directors is essentially a panel of people who are elected to represent shareholders. Every public company is legally required to install a board of directors; nonprofit organizations and many private companies – while not required to – also establish a board of directors. at the time a company is started. Such bylaws are created usually after the Articles of IncorporationArticles of IncorporationArticles of Incorporation are a set of formal documents that establish the existence of a company in the United States and Canada. 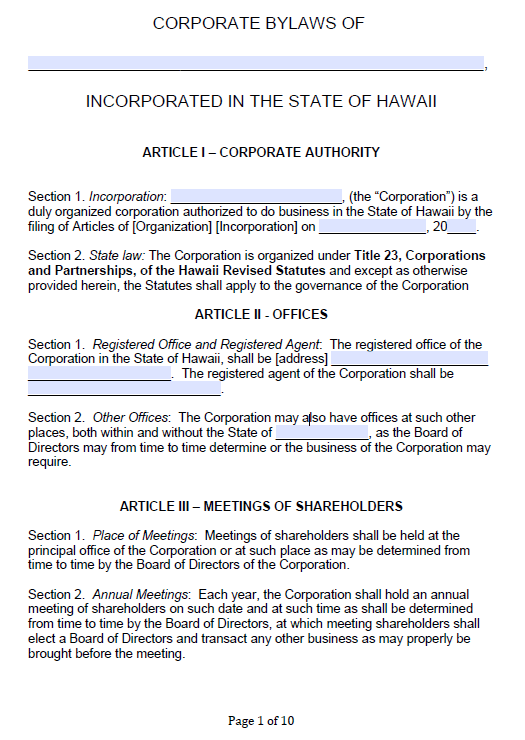 For a business to be legally recognized as a corporation, it must file these documents with the Secretary of State or company registrar where the company chooses to operate. Some states are submitted, which is why a lot of people often get confused between the two. They are essentially written as a single document that contains the standards that the company should follow, as well as the operations that it will perform throughout its existence. The company bylaws specify, among other things, the duties and responsibilities of the board of directors, the procedures that need to be followed whenever a meeting is held or whenever an issue requires action, and the means to modify the existing bylaws if necessary. The Articles of Incorporation are necessary in order for an organizationTypes of OrganizationsThis article on the different types of organizations explore the various categories that organizational structures can fall into. Organizational structures to be created legally and be included among the independent business entities in a given state. Containing the most basic information about the company and outlining what it is about, the Articles of Incorporation are drafted and then filed with the state agency that is in charge of business registration. The bylaws, on the other hand, need not be filed with the state agency. They are used within the company as a guide for efficient operations. Drafting the bylaws is often considered the board of directors’ first action as a business entity. Company bylaws are more detailed, as compared to the Articles of Incorporation. The bylaws should contain information on the board of directors, as it is the governing body of the organization, including its duties and powers. The information specifies things like the number of years a member can stay on the board and the number of members needed to form a quorum. The bylaws also define the procedure to be followed when replacing a member or a corporate officerCEOA CEO, short for Chief Executive Officer, is the highest-ranking individual in a company or organization. The CEO is responsible for the overall success of an organization and for making top-level managerial decisions. Read a job description. The statement of the company’s purpose is helpful, especially for the board of directors, because it sets the path that the company should tread. It identifies why the company was formed in the first place. With such a statement, even a change in leadership should not affect the nature of the company’s operations because its objectives have already been identified. It may also be helpful in attracting investors because they will be able to easily understand what the company is about just by looking at the bylaws. Change in management is inevitable in every organization, but its management structure is already defined in the bylaws. They also make clear the procedure for filling a higher vacant position in a way that will not disrupt the company’s leadership. One of the most basic parts of the bylaws is the identifying information of the company. This includes such things as its registered name and address, and whether it is a private or a public company. The bylaws should indicate when shareholder meetings are held and how each shareholder is to be notified of these meetings. Also indicated should be how often and where board meetings are to be held. The bylaws set the rules on how meetings are called and scheduled, as well as how they should be conducted. This provides a way for the board to remain updated of the company’s status and to address issues that concern the organization. The company should also put in place a set of rules for approving contracts and loans and other processes that the company may engage in. One of the provisions in the company bylaws is making amendments to the bylaws themselves when deemed necessary. The process can start with a member of the board raising the issue of modifying the bylaws. The length of time the changes can take effect depends largely on the board and may take more than two meetings to complete. For legality, the changes should first be approved and documented before they are adopted. The bylaws make it easy for the board of directors to function, for employees to perform their work, and for investors to understand the business. Having a set of bylaws can save time and help make the company a more trustworthy organization. Irrevocable ProxyIrrevocable ProxyAn irrevocable proxy is an enforceable power granted by the owner to another party to exercise his voting rights independently without requiring his consent each time. Typically, most proxies are usually revocable, but some agreements may include specific clauses that require the proxy to be irrevocable for a specified period.